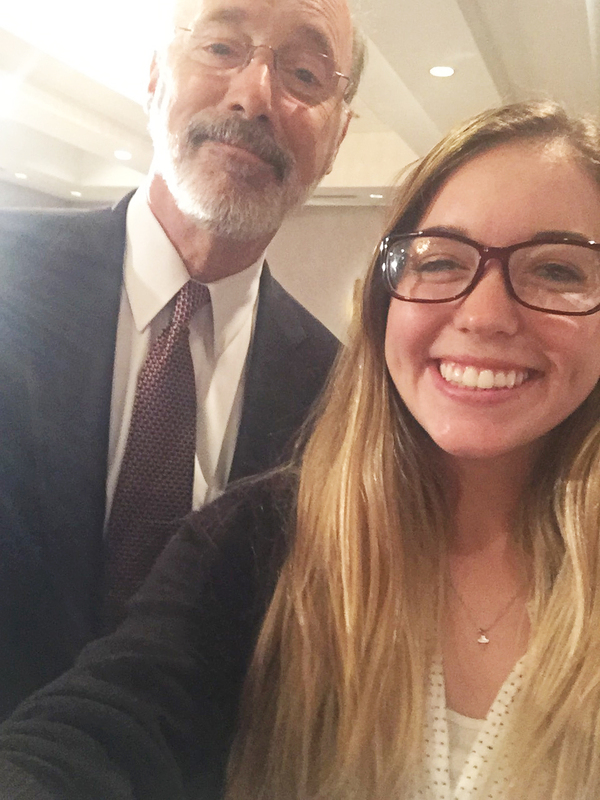 Sydney Miller, APSCUF’s fall intern, takes a selfie with Gov. Tom Wolf at Pennsylvania Press Club in September. The moment I accepted my internship with APSCUF, I was overwhelmed with excitement. Little did I know I would learn so much about my career field and learn the ways of lobbying and journalism. The staff and my two advisers, Kathryn Morton and Sean Crampsie, made this whole experience comfortable and welcoming. Both taught me new skills that I will carry for a lifetime. With any internship, you may face challenges, but you will learn valuable information and have the opportunity to understand what you want to do with your career. In this dual internship, I was able to work within in my field of political science and brush up on my writing skills. My hardest and most rewarding challenge in this internship was learning the ways of writing in a journalistic form. Kathryn was super helpful with tips and tricks to writing a blog and other pieces of importance for an organization like APSCUF. I was also able to use social-media accounts while I visited multiple universities in Pennsylvania. I want to thank Sean for his efforts of showing me around the Capitol and giving me the outlet to network. It gave me a better understanding of how the lobbying field works. Throughout my time in the Harrisburg office, I was able to meet with Gov. Tom Wolf and now-Lt.-Gov.-elect John Fetterman. I attended APSCUF’s September legislative assembly, where delegates from all 14 university chapters met. I sat in with political speakers, watched committee meetings, and met with individuals who have influenced my goals. My advice for this internship: Come to learn. I found my love for meeting with people and lobbying about issues that are important to me. I enjoyed talking to all of the faculty and staff within APSCUF, which showed me, a State System student, how passionate professors, coaches, and the staff are about providing us with an affordable education. I was able to learn what a union is and what it does for its members. 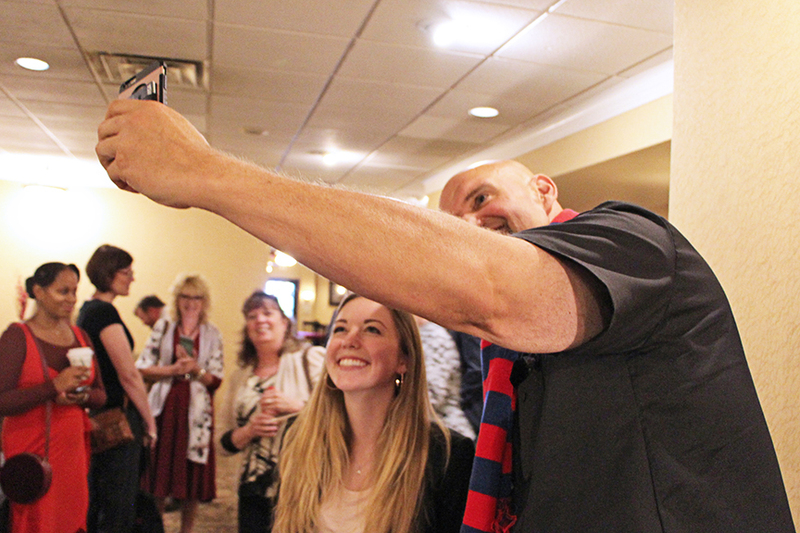 John Fetterman, during his his campaign for lieutenant governor of Pennsylvania, takes a selfie with Miller after he spoke to APSCUF’s September legislative assembly. For those who are not local to the Harrisburg area, APSCUF provides housing. For me, this was an important factor in choosing an internship. It gave me the opportunity to learn without the burden of paying for something I wouldn’t be able to afford. Overall, my time with APSCUF has been a fulfilling and humbling experience. Everyone will welcome you as a person and part of the team, which is nice for someone new to the job. Enjoy the time you have to learn and the opportunities APSCUF gives you: Not many internships will provide something as unique as APSCUF. Thank you, Ken, my two advisers, and all of the APSCUF staff for letting me experience what it is like to be a part of the team. I learned more than I thought, and you all made my fall semester a successful one. Interested in applying for an APSCUF internship? Learn more about the opportunity at https://www.apscuf.org/students/#internship.